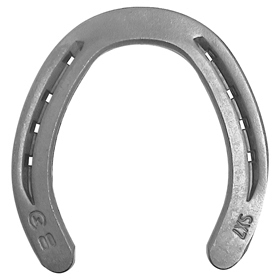 The first Kerckhaert shoe designed specifically for the North American market. These light, strong shoes are among the most popular in the line. 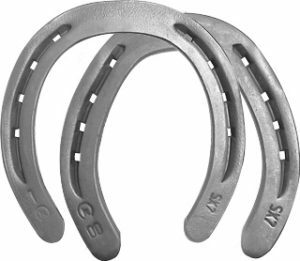 Used for a wide variety of disciplines, these 1/4" shoes allow good nailing and fit without adding excess weight. Shoes are symmetrical. Sole relief now available on fronts. Punched for 5 Slim and 5 City. The best light, clipped shoe on the market. The front pattern is quarter clipped and the hinds come with side clips. Because light shoes are often the most difficult to clip, you’ll find these are an excellent option. Strong clips on well made shoes with sole relief. Toe area is slightly wider to provide strength and wear. Shoes are symmetrical. Sizes 00-2 punched for 5 Slim and 5 City. Size 000 punched for 5 Race. 1-14 $4.40/pr. 15-44 $4.20/pr. 45+ $4.05/pr. 1-14 $6.55/pr. 15-44 $6.25/pr. 45+ $6.00/pr. 1-14 $4.35/pr. 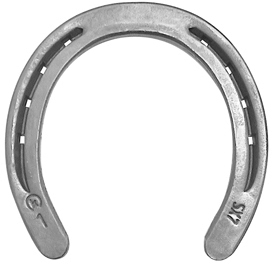 15-44 $4.15/pr. 45+ $4.00/pr.